13 Coins was open, the kitchen staff was hard at work. They have a 'wait to be seated' policy so I waited and waited and pretty soon there was a crowd of about a dozen behind me and we waited. One guy went and asked the kitchen staff about a seater and was told to wait. Finally a waiter came by and said we had to wait because he was the only server there. I declared bankruptcy. If/when I ever got seated, getting food seemed like it wasn't going to happen. No biggie. I figured I'd come home, get breakfast, and then walk up to the grocery. It was still snowing and not very cold - probably just below freezing - and, most importantly, not windy. So I walked around and took pictures and loved the crunch. But, then, I hit a block where the snow was deep and, in fact, it started to get into my boots. So home. And happy to be here. I have coffee and there are eggs in the fridge and bread for toast. I'm happy. Oh and it just stopped snowing. It's so clear and crisp. I can see one major avenue from my living room. Usually it has cars backed up and waiting for the traffic light to move. Today, we got nothin. I haven't seen a car go past in five minutes. Oh, wait there is one single van going very slowly. And Uwajimaya just changed their minds. 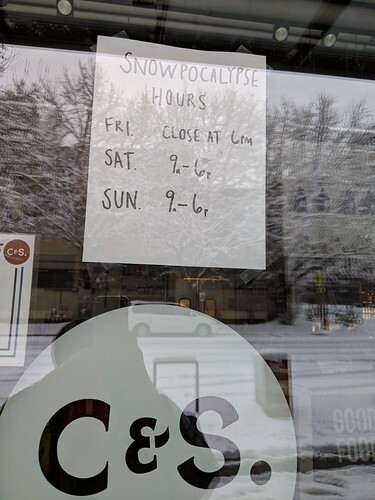 All Washington State stores closed today. Ok, then. I have power, and food, and entertainment. I don't need to go anywhere. I just looked up and saw this. What if the snow is joined by ice and breaks the limbs off the Tree That I Hate?! Oh that would be so nice. 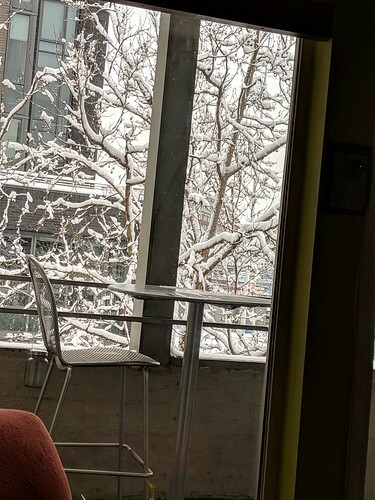 Yes, the snow view wouldn't be as nice but the rest of the year would be wonderful. This is the little hipster bodega (yeah, I get that those words do not go together) in the next block. Wonder if they actually bailed. Corner near my house. I think this may be my favorite photo of the 'hood every. 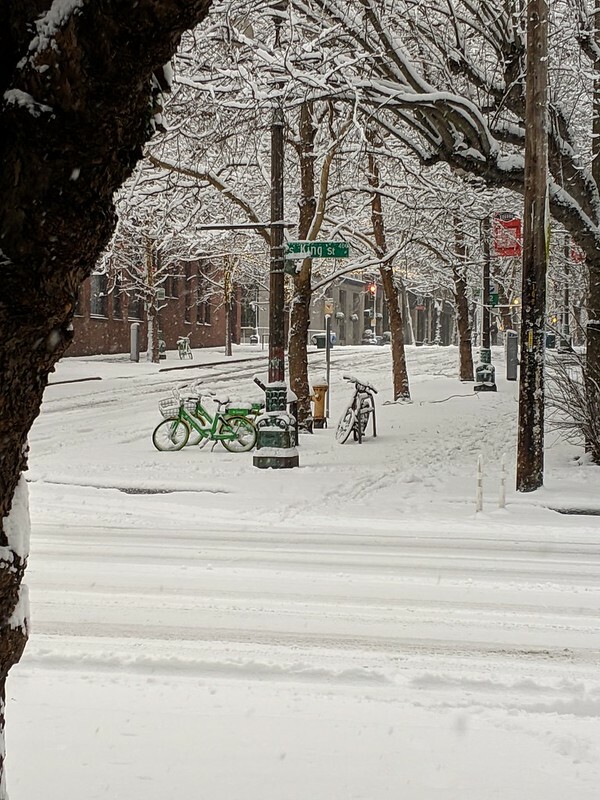 [Edit] just saw that a new restaurant down the street 'liked' my snow selfie so I sent them a DM asking if they were open for brunch today. they are opening at 11:30! i'll go support a new local business and get a fun meal. that works for me. maybe i'll have some toast to get me to 11:30.